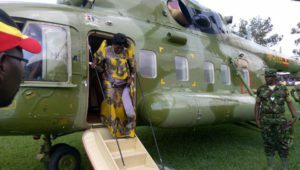 Kadaga disembarks from a chopper at Legends Rugby Grounds. Courtesy photo. The Speaker of Parliament Rebecca Kadaga this evening flew a chopper to Legends in Kampala to watch the Uganda Rugby Cranes tussle it out with continental legends Namibia. 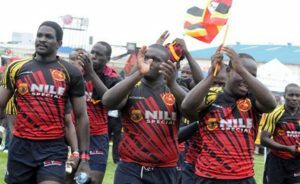 Uganda Rugby Cranes suffered their first loss in the 2017 Africa Gold Cup after a 48-24 pummeling by Namibia at Legends on Saturday. Namibia started on the back foot as the home side put up phases that led to an early lead but the Namibians ran riot thereafter and scored two tries to take a 22-10 lead by half time. Uganda was totally out-classed in the second half as Namibia dominated the scrummages often forcing the hosts into errors. With Ivan Magomu and Solomon Okia limping with injuries the Namibians took advantage with their quick transition in attack. Head coach John Duncan made changes late in the game and the visitors ran in two tries to seal their fourth straight win of the campaign. Namibia now lead the six-team log with 20 points with a game to play in the campaign. Some of the Rugby Cranes plaayers who played against Namibia. Courtesy photo. However a section of ‘paranoid’ Ugandans used social media platforms to blame Rugby Cranes loss on the delayed start of the game occasioned by the wait for the Speaker’s chopper to land at the venue where the game was to be played. Early this year, there was talk that the 10th Parliament was planning to procure a helicopter for Speaker Rebecca Kadaga worth $5.5 million. At the time, the Parliament Director of Communication and Public Affairs, Chris Obore, issued a statement refuting the helicopter allegations and accused government officials involved in the shs6 billion presidential handshake of being behind the development with a major aim of attempting to divert public attention. However, what started as a rumour took a new shape when Buikwe North MP Paul Musoke “finally” presented a proposal to Parliament asking government to procure two helicopters; one for the Speaker and the other for the Chief Justice. He stated that the proposal will enable strengthen the independence of the different arms of government. Attempts to get a comment from Obore were futile as his known phone number could not be reached by press time.